Save time by placing your order online. With advanced ordering options and easy access to your account, you’ll avoid hours of wasted time. Access your account 24 hours a day. You can check order status and manage your order history, accounts receivables and more. 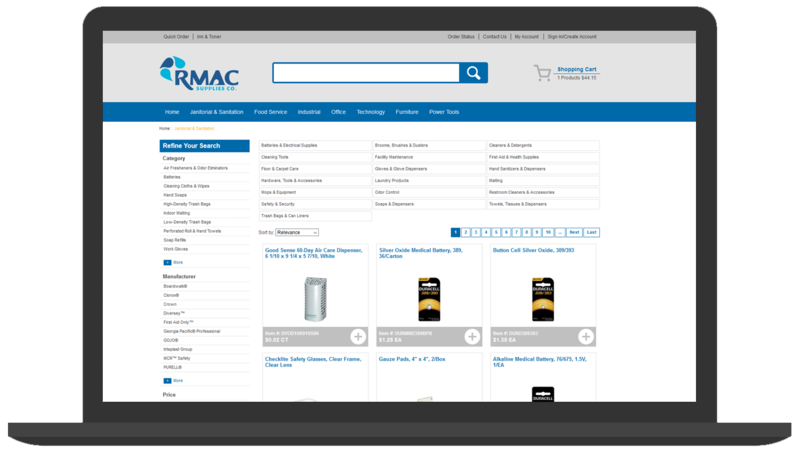 Browse our extensive product line and see what works for your facility. Our product catalog is constantly updated to ensure that you’re getting the best quote possible. Your tenants will greatly benefit from the spanking clean space, and your real estate ranking will rise. We’ll help you create an efficient, cost-effective maintenance plan and provide you with all the supplies at the best prices on the market. If you’re responsible for an educational institution, you want to have Rmac help you keep your facility safe and supplied. We’ll provide you with practical solutions to keep your students safe, happy and learning. We carry the most updated school equipment, furniture, safety and janitorial solutions for educational facilities of every size. We offer food service, sanitary and janitorial supplies with same day or next day delivery service. As a medical provider, you will have your HCAHP improve, your expenses decrease and your patients happy and content with the care they receive. Outrank your competitors by scoring better reviews for cleanliness and timeliness. Join the ranks of the many hotels that benefit from Rmac’s hospitality supplies and enjoy a spanking clean, fresh and stocked facility. Your clients rely on you to get the job done, and you can rely on Rmac to make it happen. Whichever venture you’re responsible for, we have the cleaning supplies, janitorial equipment, cutting edge machinery and more to get it done perfectly. The biggest concern in the foodservice industry is keeping the food appetizing and clean providing food at quick turnaround. With our extensive line of foodservice supplies, ware-washing supplies, and janitorial equipment, you can keep those dishes coming, and we’ll keep your facility running like clockwork. You’ve got property to upkeep, tenants to please and a budget to worry about. With us, it’s easy and effortless. We have the gear and prices to keep your property safe, clean and beautiful at the lowest prices on the market. At Rmac, your account manager will ensure 100% productivity in your industrial manufacturing facility at all times. From safety gear for your workers to cutting-edge tools and nifty innovations for all your industrial needs, we have everything to keep your business profiting all day, every day. Experience the ease of cutting edge e-commerce and enjoy our constantly updated comprehensive ordering options. You’ll avoid hours of wasted time with our user-friendly ordering system. Place orders, manage your account and check order status 24 hours a day by signing into your account. Our fleet of trucks and experienced drivers are at the ready to get your order to you on time, all the time. Feel secure with the knowledge that you won’t be out of supplies or equipment because we have one destination in mind. And that’s 100% customer satisfaction. Our line of janitorial equipment is unbeatable, and you’ll find all you need to keep your facility – regardless of size – clean and sanitary. In addition, our factory trained equipment specialists provide on-site support as well as in-shop repairs to diagnose and repair all your facility equipment. Our dedicated account managers will customize solutions for your facility regardless of how difficult and detailed your requests are. Whether you need custom sizes, specialty products or dietary specifications, we are the right address. It’s our competitive pricing that makes you contact us, but it’s our unparalleled customer service and support that keeps you coming back. Each client has a designated account manager who invests the time necessary to know you and your facility to ensure that all your needs are met. Rmac places great emphasis on the environment. We provide green seal cleaning materials and chemicals that protect public health and create a healthier work environment. Your employees and occupants will feel better with our LEED approved sustainable products. Rmac Supplies is a Leading Supplier For Janitorial Supplies, Floor Equipment, Safety, Food Service, Office Supplies & more.